Jack Hogan graduated from Bogart High School in 1954. His younger brothers, Donald (Class of 57) and Larry (Class of 59) graduated from Oconee County High School on Mars Hill Road. Donald and Larry were at OCHS while I was attending there. Their father, “Preacher Hogan”, was a minister at the Bogart Church of Christ. My mother attended that church as a teenager. 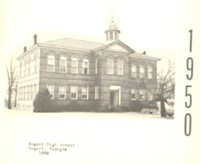 Mr. Hogan also served as County School Superintendent in the 50’s and later served as Mayor of Bogart. Jack has lived in Tennessee for many years and is now retired. He played basketball in High School and College. Like his two brothers, he had considerable athletic talent. From time to time, Jack writes about his experiences and memories of Bogart. Folks who grew up in small towns and rural areas of the 40’s and 50”s can identify with many of Jack’s remembrances. As one who attended the Watkinsville School in the 40’s and 50’s, I remember many of those days of a quieter and slower-paced life. Those experiences helped mold us and gave us roots. Sadly, many young people of today do not have those experiences and roots.Our society is the poorer because of it.